Getting enough resolution: To enjoy the same high quality prints from your digital camera that you’ve come to expect from your film camera, you need a camera that offers moderate-to-high image resolution, which costs. Images from lower-priced models just don’t contain enough picture information to produce decent prints. 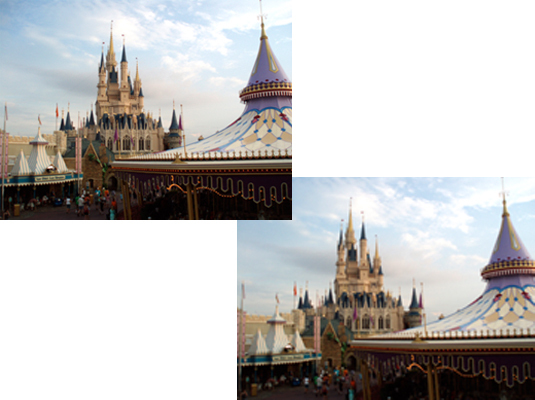 A digital photo from a high-resolution camera (left) and a low-resolution camera (right). Dealing with delays: On many smaller or less expensive digital cameras, after you press the shutter button on a digital camera, the camera requires a few seconds to record the image to memory. During that time, you can’t shoot another picture. With some cameras, you also experience a slight delay between the time you press the shutter button and the time the camera captures the image. Having to become tech savvy: Becoming a digital photographer involves some skills you may not yet possess. If you’re familiar with a computer, you shouldn’t have much trouble getting up to speed with digital images. A digital camera may look and feel like your old film camera, but underneath the surface, it’s a far cry from your father’s Kodak Brownie.